Laughing Buddha (LB) is a “mostly sativa” cannabis strain that has gained popularity among consumers who prefer the more uplifting and energizing sativa strains. LB is commonly recommended for focus, alertness, clarity, giggly elevated mood, and creativity. LB was developed by Barney’s Farm from Jamaican and Thai landrace (wild) genetics. Centuries of Jamaica’s long days, tropical climate and competition for sunlight among other fast-growing plant species surely contributed to LB’s tendency to grow tall. Laughing Buddha takes more vertical space and 30% more time to harvest than most commercially available strains. It is apparently this hunger for head space, and the fact that it takes about three weeks longer to grow, that urges most growers to choose another strain. Reduced annual crop production for that space, about a 30% reduction, is the type of sacrifice growers make to stay in demand. Quincy Green's Laughing Buddha owes its signature aroma to terpinolene, ocimene, myrcene, β-caryophyllene, limonene and pinene. The graph in the video is the result of repeated crop sampling from the same LB clone. 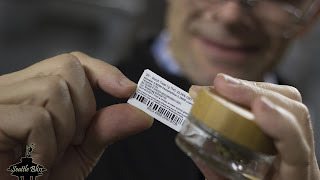 The grower in this case is seizing the opportunity to examine their LB clone’s average cannabinoid/terpenoid profile by ordering a terpene assay along with their state-mandated tests. Once a statistically accurate profile exists, usually at fifteen duplicate assays over time (1), the crop can be certified for chemotype. Terpinolene is the most prevalent monoterpenoid in LB. Terpinolene research is currently centered on conifer sap and livestock feeding. However, as it is the dominant terpene in many uplifting cannabis strains popularly classified as a sativas, further study is eagerly anticipated. The scent of terpinolene is often expressed as “fresh” or “clean”, like a deodorant. It has no anti-feeding effect on grazing animals (2), which means the animals aren’t disgusted (eating discouraged) by terpinolene. Myrcene is a very common monoterpenoid in cannabis. Its metabolic activities include analgesic, anti-inflammatory, sedation, muscle relaxing, and inhibiting cancer cell formation. It blocks inflammation via PGE-2 (3) and inhibits cancer formation by aflatoxin in liver cells (4). Pain intervention from myrcene can be blocked by naloxone, but most individuals will not encounter this situation. Myrcene’s sedating properties have long been evidenced by German hops preparations for sleep (5). It is believed that this prominent sedative terpenoid may be responsible for the “couch-lock” phenomenon many recreational consumers either rave or complain about (6). β-Caryophyllene is one of the most common sesquiterpenoids found in cannabis (7; 8). As it is a large (heavy) molecule and is prevalent in many cannabis drug strains, caryophyllene is often more prevalent in aged cannabis. This is purely due to caryophyllene’s massive size (among terpenoids), which causes it to remain in the glandular trichome heads long after the more volatile, more pleasant-smelling monoterpenoids have evaporated away (7; 8). Commonly found in black pepper (Piper nigrum), many consumers can detect and recognize the presence of caryophyllene in cannabis by its familiar odor. Caryophyllene is cytoprotective to gastric cells (9), has demonstrated as a full agonist to CB2 receptors (10), and produces anti-inflammatory and analgesic activity at a low dose of 5 mg/kg in mice (10). Laughing Buddha by Quincy Green is an exceptional value at $42 for a 3.5g jar ($12/g) [November 2017]. Lab tests indicate that this crop tested at 15.6% THC, which is exactly where it should be. The grower doesn’t order a terpene assay for every batch, but does so from time to time as a quality control measure. [See the video: top of this page.] Buds are beautifully trimmed, cured to perfection, and only the live flower could be more fragrant. 1. Identification of terpenoid chemotypes among high (-)-trans-Delta-9-tetrahydrocannabinol-producing Cannabis sativa L. cultivars. Fischedick, Justin T. 1, Union City, CA : Mary Ann Liebert, Inc., March 29, 2017, Cannabis and Cannabinoid Research, Vol. 2, pp. 34-47. 2. Effects of gamma-terpinene, terpinolene, alpha-copaene, and alpha-terpinene on consumption of alfalfa pellets by sheep. Estell, R. E., Fredrickson, E. L., Anderson, D. M., & Remmenga, M. D. 8, 2005, Journal of Animal Science, Vol. 83, pp. 1967-1971. Full article pdf published at USDA (URL below). 3. Myrcene mimics the peripheral analgesic activity of lemongrass tea. Lorenzetti BB, Souza GE, Sarti SJ, Santos Filho D, Ferreira SH. 1991, Journal of Ethnopharmacology, Vol. 34, pp. 43-48. 4. In vitro inhibition of CYP2B1 monooxygenase by β-myrcene and other monoterpenoid compounds. De-Oliveira, A. C., Ribeiro-Pinto, L. F., & Paumgartten, F. J. 1, 1997, Toxicology Letters, Vol. 92, pp. 39-46. View at the UW library..
5. Wichtl, Max, [ed.]. Herbal Drugs and Phytopharmaceuticals. 3rd. Stuttgart, Boca Raton : Medpharm Scientific Publishers, 2004. Accessed at University of Washington Medical Library (too expensive to buy). 6. Taming THC: potential cannabis synergy and phytocannabinoid-terpenoid entourage effects. Russo, Ethan B. 7, 2011, British Journal of Pharmacology, Vol. 163, pp. 1344-1364. 7. Essential oil of Cannabis sativa L. strains. Mediavilla, V and Steinemann, S. 1997, Journal of the International Hemp Association, Vol. 4, pp. 80-82. Compared mostly fiber type, found most pleasant smelling strains high in monoterpenoids, bad smelling strains high in sesquiterpenes, but this reviewer could not find support for Russo's ref/citation (from "Taming THC") that beta-caryophyllene is the most common sesquiterpenoid. For this reason Ross and ElSohly, 1996, is cited below. 8. The volatile oil composition of fresh and air-dried buds of Cannabis sativa. Ross, S. A., & ElSohly, M. A., 1996, Journal of Natural Products, Vol. 59, pp. 49-51. Article established that terpene profiles in cannabis essential oils remain qualitatively unchanged over time, though cannabinoids degrade. 9. Gastric cytoprotection of the non-steroidal anti-inflammatory sesquiterpene, β-caryophyllene. Tambe, Y., Tsujiuchi, H., Honda, G., Ikeshiro, Y., & Tanaka, S. 05, 1996, Planta Medica, Vol. 62, pp. 469-470. Full article accessed online at UW HSC library..
10. Antiinflammatory cannabinoids in diet–towards a better understanding of CB2 receptor action? Towards a better understanding of CB2 receptor action? Gertsch, J. 1, 2008, Communicative & integrative biology, Vol. 1, pp. 26-28. Caryophyllene is a full agonist at CB2 in vitro; perhaps also in vivo, but likely a partial agonist..
 LB requires about 90 days in flower, compared to Gorilla Glue, which finishes in about 63 days. Terpinolene is also known as δ-terpinene (delta-terpinene) and identified as such by some labs. Laughing Buddha clone grown by Washington licensed I-502 Producer Quincy Green. All “LB” references in this report refer to clones from this genetically unique individual. Naloxone is administered by injection as a life-saving measure in the event of an opioid overdose.